Garden Bytes from the Big Apple: Don't panic...it's normal! I write this as a community service. For all you garden owners who are panicking about the brown interior leaves on your arborvitae (Thuja plicata) and for all you gardeners, whose clients are panicking about the brown interior leaves on your arborvitae: "Don't panic, it's normal!" Just because a tree is evergreen doesn't mean all its leaves will stay green for ever. 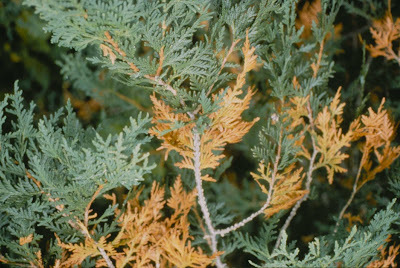 Arborvitae can lose almost 1/3 of their interior leaves every year, usually in fall. The official name for this dread condition: needle drop! 1) call me at all hours of the day or night, asking me to come over and look at your trees RIGHT AWAY!!! 3) rip down the morning glories I planted at the base of your arborvitae which have finally climbed all the way up and now look really cool, because you think the tiny annual vine is choking your 15 foot tall evergreen tree. Because it isn't. Think of this as the molting season for arborvitae. It'll all be over in a few weeks, so pour yourself a drink and give your gardener a break. Believe me, she cares about those trees as much as you do and if there's something wrong, she promises to let you know. I always knew you were the height of fashion but now we have photo proof! You say tomato, I say tomaccio! It's not about the plants.